The lake in the crater is at the forefront, the ocean behind the rim. The bus to the village of Joao Bom “John the good” leaves Ponta Delgada harbor at 9:30 AM. By 11 AM, I am on the trail climbing, climbing the 500m to the top of the volcano of Sete Cidades. 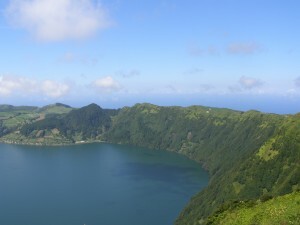 This is the westernmost volcanic mount that forms the island of Sao Miguel. The walk up the slope is grueling and within minutes I think of turning back. A jeep of farmers passes me by, another SUV comes down the hill. These are not isolated paths for walkers and ramblers, but in fact well used farming tracks. Now seen by others, my resolve is firmed. I push down my twin walking sticks and keep climbing. The lowing of cattle is the first sound that something is headed my way. I push myself against the wall of the trail, into the thickets of Himalayan ginger as a herd of Azorean cows come towards me. They halt at my sight unsure what to do. Beside me, someone has left the gate to the farm open, and they ramble past me into the fields. The cattle are being herded by three children, a woman barely out of her teens and her siblings. The boy is youngest at twelve and gives me a shy smile as he runs to gather the errant cattle. The girls in their gumboots are happy to let me video the cattle as they make their way downhill. I keep walking up, my encounter with the farming family is also a chance to catch my breath. I do not know why, but it gives me intense pleasure to watch young people working in farms. In the market, I see young men flicking dry kernels of corn at each others’ ears while they wait for customers, and it gives me hope for the future. In Canada the farmers I meet are mostly grizzled old men, but here sons and daughters don’t desert the land for cities and desk jobs. For once progress does not seem as golden as it always appears. It takes me the better part of an hour to climb up to the rim of the volcano, but I get there huffing and puffing. The sight is like a spell that lifts the tiredness from my legs and shoulders. A cool breeze fans over the crater with its two lakes, one blue and the other green. Behind him the Atlantic ocean is calm as a pond. Lazy clouds drift over the sun from time to time. The rim of the crater is broad like a road and I walk along the curve alternately peeking into the steep insides and the shallower slopes outside where cattle and corn are grown on the usual small allotments. There is a town inside the crater, and the image of life inside the volcano reminds of Switzerland in summertime. This is perhaps the most beautiful part of the island I have visited so far. I head down the hillside to the town of Remedios and catch the afternoon bus back to the apartment. I am exhausted and my knees are bothering me, but the sight, sounds, and smells atop the volcano balance the physical tiredness.